Bushman Equipment, Inc, a manufacturer of custom-engineered material handling solutions, has delivered two unique jib cranes to an aluminum mill in the Middle East. 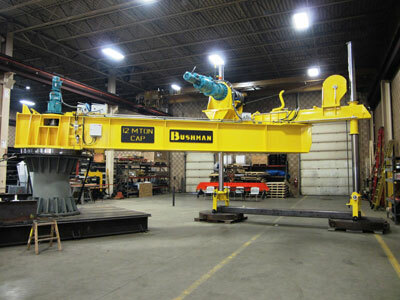 Bushman’s customer provided a number of its casting systems that included Bushman’s semi-automated jib cranes, or “manipulators”, to lift and set the distribution troughs over the casting pits where 30-foot long aluminum billets and ingots are formed. Pete Kerrick, president of Bushman, stated that the challenge for his engineers was not only the physical size and capacity of the jib cranes but also the Factory Acceptance Test which was mandated. The contract required partially erecting the manipulators in Bushman’s shop and demonstrating all motions and devices—including lifting about 50% load and swinging it through a 45° arc. Total Machine Weight: 40,000 lbs.